There’s a huge, but underexplored, problem with the Book of Mormon: it don’t get no respect. It’s not just in the world outside of Mormonism that the Book of Mormon gets no respect, though: even in Mormonism, too frequently, rather than engaging the Book of Mormon’s text, we use it as evidence of the Truth of the church (“If the Book of Mormon is true, it means Joseph Smith was a prophet; if Joseph Smith was a prophet, the Church of Jesus Christ of Latter-day Saints must be the True Church!”). As Grant Hardy explains, both the Mormon and the non-Mormon approaches have something in common: they use the Book of Mormon to examine something extrinsic to its contents. [fn3] As a result, it often feels like the text itself gets neglected. 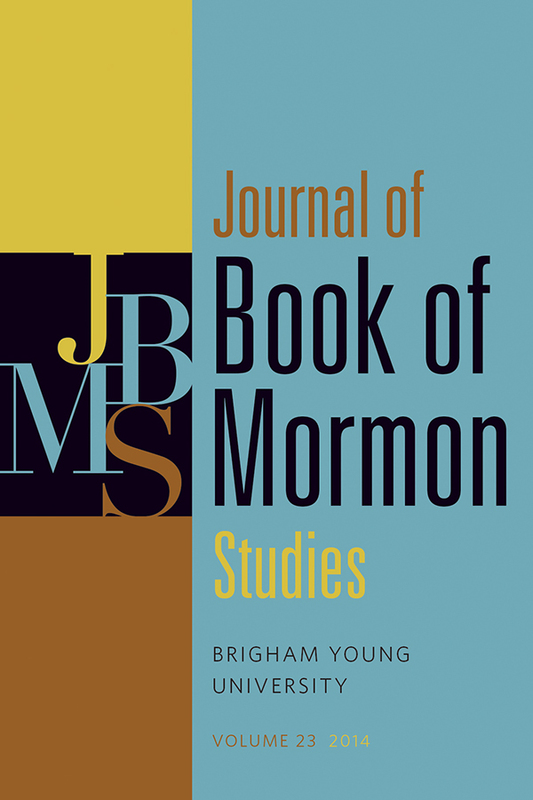 Enter the most recent Journal of Book of Mormon Studies, published by the Maxwell Institute. Beginning with volume 23, the editors tell us, MI intends to “increase the academic focus and broaden the intended audience of the Journal of Book of Mormon Studies.”[fn4] They hope that this serious study—by and for Mormons and non-Mormons alike—will help the Book of Mormon take its place among the other world scripture in the eyes of academics, while helping members of the Church better engage with the text of their sacred scripture. A couple caveats on this: first, the articles are not primarily interested in convincing you of the historicity of the Book of Mormon, or its truth. That’s not to say that either historicity or religious truth are not valuable inquiries, or that apologetics is somehow bad and shouldn’t be done. It’s also not to say that they do the reverse; in fact, most (if not all) assume the historicity of the Book of Mormon, and take its truth as a given. This allows them to move beyond questions of truth and historicity, and instead focus in detail on the content of the Book of Mormon. But that’s not to say that Terry’s article–or the Journal itself—isn’t valuable. Even if I don’t agree with Terry’s ultimate conclusion, he provides a careful, thoughtful walk through the questions of translation. While I may end my walk in a different place than he did, he made me think. And every single article made me think, showed me connections (both within the Book of Mormon itself and between the Book of Mormon and other religious texts) I hadn’t noticed, and shocked me out of any kind of stuporous reading. Every article, in other words, respected the text it focused on, and gave it a careful and critical reading. Likewise, the fact that it is not focused on apologetics or on historicity has no moral valence; it is neither good nor bad. It is simply the focus that the current editors have chosen; in the 200 or so pages available, it cannot be all things to all people. That said, if your interest expands into close readings and careful analysis of the Book of Mormon’s contents (and it should), you should definitely check it out. [fn6] I found the volume intellectually stimulating, and a worthy introduction of the Book of Mormon to the Academy at large, but it was more than merely an intellectual exercise. As I accompanied careful and thoughtful people fitting together the puzzles they explored, I found spiritual stimulation. The Book of Mormon, it turns out, stands up well to a careful exploration. You can read samples from volume 23 of the Journal of Book of Mormon Studies here. You can subscribe here. [fn1] See Richard Bushman, On the Road with Joseph Smith: An Author’s Diary 47, 114 (2007). [fn2] Grant Hardy, Understanding the Book of Mormon: A Reader’s Guide xiii (2010). [fn4] 23 Journal of Book of Mormon Studies vi (2014). [fn5] Note that I’m not saying that the previous iterations of the Journal didn’t work. Frankly, I haven’t read them, and I don’t know what their goals were. What I do know is that, based on this volume of the Journal, it meets the goals that the current editors have set out for it. [fn6] You know what else you should check out? The MI podcast. Every episode has been great, but if you want what, for my money, is the best two hours of listening you can enjoy, listen to Blair’s discussion of race and the church with Paul Reeve and Ardis Parshall in episodes 22 and 23. Great write-up Sam. Your Rodney Dangerfield-esque intro reminds me of a passage in Daniel Walker Howe’s _What Hath God Wrought_, which I read about two years ago having no idea that I would encounter such a gem. I think I will check out this edition of the Journal of Book of Mormon Studies, perhaps even breakdown and order a subscription. Though I’ve been a member of the church my entire life, the B of M has never resonated with me. The historicity issues are not the problem (though I have serious doubts about the tome’s historicity); rather, I just can’t seem to connect with the text. Its constant repetition of platitudes—”if you keep the commandments, you will prosper in the land”—, the never ending wars between the two sides, and its tendency to portray everything in stark, black and white terms, pales, by comparison, to the deep truths and nuances embedded in the New Testament. I’m sure I’m missing something; perhaps the Journal of B of M Studies will help me see what I have overlooked. Michael Austin: I have Howe’s book on my shelves but I have never read it. Your comment about his edition to the Oxford History of the United States—which I know has received very good reviews—has prompted me to move it to the top of the pile (right after I finish “Wolf Hall”). My “resolution” of the translation puzzle is a bit surprising, but my analysis finds several fundamental (perhaps fatal?) weaknesses in Gardner’s theory, so I had to look at other options. To get the whole picture, though, you would need to also read my two recent articles in Dialogue (47:2 and, especially, 47:3). Also relevant are the four presentations given on March 14, 2015, at a conference at BYU, featuring Royal Skousen as the concluding speaker. The conference was titled “2015 Exploring the Complexities in the English Language of the Book of Mormon,” and videos of the presentations, I understand, are supposed to be available sometime soon at the Interpreter website. FWIW, Grant Hardy is also leaning toward an explanation similar to what I suggest. Blair, thanks for the recommendation. I will definitely check out the article on Alma 32. And Roger, I look forward to perusing your recent articles in Dialogue (though I subscribe to that publication, I have fallen a bit behind in my journal/magazine reading). I am always intrigued by new theories and ideas concerning the sacred texts of any religion. FWIW, I’ve been teaching excerpts from the Book of Mormon (as well as the King Follett Discourse) in my American Literature survey courses for about 15 years. Like FarSide, I’ve found the Book of Mormon difficult to connect with for various reasons. I’ll have to check this out. It may help me connect with the text in a better way. I’ve often wondered why the Book of Mormon isn’t taught or used in American Literature classes; regardless of historicity, it’s still American literature and I’m glad to see someone is doing it! I loved taking Bible as Literature classes, and I don’t remember anyone being concerned about the divinity of the book, but perhaps I was just oblivious.